Can I Give My Ferret Pedialyte? | Can i Give My Ferret? Can I Give My Ferret Pedialyte? Can You Give your Ferret Pedialyte? 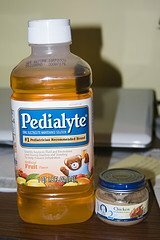 Pedialyte is an oral electrolyte solution designed for children. It replaces fluids and minerals that are lost during diarrhea and vomiting. This solution contains precise amounts of sugars and electrolytes to promote quick fluid and electrolyte absorption. It is to be mixed with a particular quantity of liquid to maintain fluid and electrolyte balance in children are suffering from symptoms of diarrhea. Pedialyte contains appropriate combination of sugars and electrolytes that is safe for ferrets. Giving this formulation is suggested for to replenish the electrolytes and keep a sick ferret hydrated. It is also recommended to only give unflavored Pedialyte to ferrets. Other known hydration beverages, such as sports drinks, sweetened sodas and juices, have a higher amount of sugars, which could make your ill pet worse. You must avoid giving your ferret anything that is too high in carbohydrates or sugar. Also remember that no other fluids should be mixed with Pedialyte unless it is recommended by your veterinarian. If other fluids are added, the efficiency of the formulation may be altered. Precise quantities and ratios of electrolytes and sugars per volume must be followed. Monitor your sick pet and ensure he stays hydrated. You can feel his tongue and gums to check their moisture level. Ferrets will seem disoriented and lethargic if dehydrated. If you suspect that your pet is dehydrated, get him to the veterinarian as soon as you can. To prevent dehydration, you can give your ferret a mixture of Pedialyte and water to drink. Half Pedialyte and half water is a safe ratio. Remember that just a few bouts of diarrhea and vomiting could lead to dehydration. You should also give fluids that are at room temperature as cold water can upset the stomach of your ill ferret. If your ferret refuses to drink the water with Pedialyte, or he is not taking in any fluids, then you may have or is refusing to drink the mixture, you may have to syringe feed the mixture. However, be extra careful while doing this as they can aspirate the fluid and in turn develop an infection. Slowly introduce the mixture into the side of your pet’s mouth, one small drop at a time. Be very patient as your ferret might resist at first. Angle the syringe tip towards the front of your ferret’s mouth to allow him to swallow the fluid on his own. It is ideal to have your sick ferret to drink around fifteen milliliters of the solution every three to four hours or as per instruction of your veterinarian. Refrain from giving your sick pet solid foods. One of the most common problems that ferret owners have is administering food when their pet is terribly sick. It is best to give your ferret soluble foods. You can feed him moist kind of ferret food instead of the normal ferret pellet. Other owners also give their ill ferrets some homemade duck soup. If you have other ferrets in the house then it is suggested to quarantine the sick ferret. Place them in separate rooms. You can also prevent the spread of viruses and germs by keeping your pet’s cage clean. Make it a habit to wash your hands first before you play with your ferrets. Regularly clean up any mess your pet makes and wash his toys regularly. Also, try not to touch your ferret if you have a cold or flu. Colds can be passed to your ferrets pretty quickly. And the best prevention of all is to keep your pet’s immune system in top shape. Make sure your beloved only eats healthy kinds of food. His diet should always be high in animal protein and fat. Fresh water is likewise a requirement to ensure a healthy body. Caring for a sick ferret is quite a challenging yet rewarding experience. It is however, imperative that you take your ill ferret to a veterinarian for correct diagnosis. You need to ask a professional so you can be guided well on how to handle the situation. A simple cold or flu could possibly turn into something serious, like pneumonia or dehydration. Also, do not administer any over-the-counter medications without checking with your veterinarian first. Incorrect dosage may kill your beloved pet. Lastly, give your ferret constant love and attention, regardless if he is sick or not. At the end of the day, your affection may be all that he needs to be able to recover quickly. Thank you for the great advice & the extra tips! Thank you thank you! !